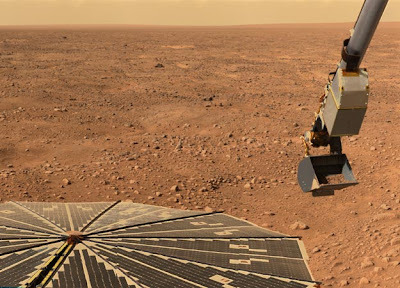 Not long after NASA's Phoenix Mars Lander reached the Red Planet on May 25, 2008, it began digging into virgin Martian soil to look for signs of life-supporting conditions. With only months to explore its permanent resting place before freezing, scientists wasted no time beaming back a steady stream of astonishing images. Here are some of the best shots Phoenix has sent back to Earth. Within days of wrapping up a 10-month, 422-million-mile journey to Mars, Phoenix started digging into its dusty surroundings. 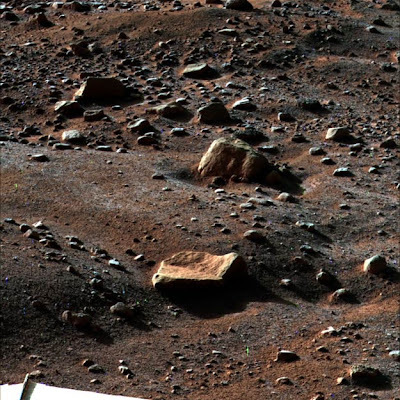 This shot, taken about 16 days after landing, reveals the bumpy terrain of northern Mars. 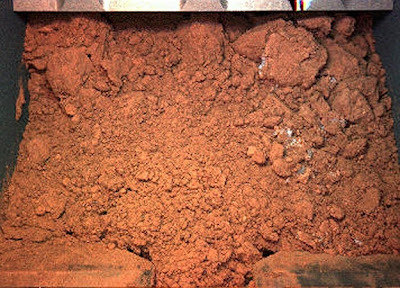 In the scoop of Phoenix's robotic arm is a dirt sample being carried to an on-board microscope. 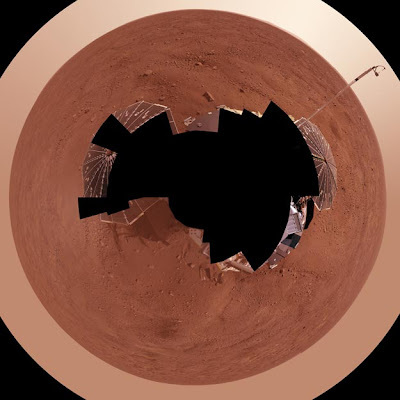 One Scoop : Phoenix was equipped with only eight pen-sized ovens to bake and sniff samples of Martian soil -- not a lot for a extended stay on the Red Planet. Needless to say, picking which piles of dirt to sample wasn't an easy task for scientists searching for life-sustaining conditions. Shown here is a test scoop of soil -- the first-ever dug by Phoenix -- that wasn't baked. Small white patches in the grit are likely ice. Mars In 360 View : Might be tough to make out this image, but you're looking at a 360-degree view from atop the Phoenix Mars Lander. Scientists used the double-vision of the SSI (Surface Stereo Imager) to patch together this quilt of 400 images. At center, just below the black blind spot of the camera, is one of the first trenches Phoenix dug . The long pole at right (between the black solar panel arrays) is the spacecraft's meteorological station that monitored air temperature, wind speed and visibility. 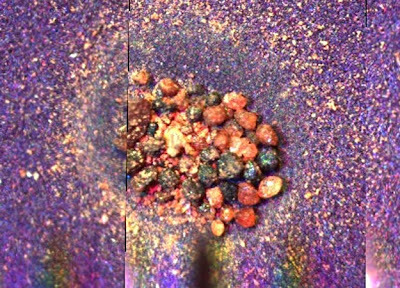 Shown here is a bit of wind-blown Martian grit that Phoenix found in its optical microscope compartment. Magnetic grains of dirt appear orange, and each is just a few thousandths of an inch wide. 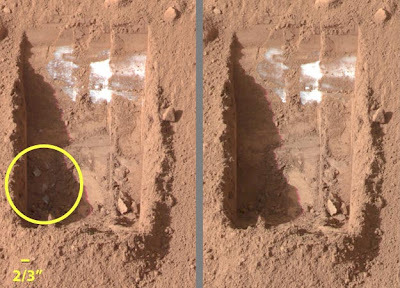 Disapearing Act : Just about every robot sent to Mars has detected signs of water, but never first-hand evidence. Phoenix was the first to do so in two ways: One, by catching these whitish chunks of ice (left) in a freshly dug trench sublimate into thin air. Second -- shortly after this snapshot -- the robot collected a sample of icy dirt, baked it and sniffed water vapor directly. Refreshing! Morning In Mars : The north pole of the Red Planet is an icy stretch of real estate even during the Martian summer. As summer waned, sunlight faded and Phoenix began to observe morning frost on the bumpy terrain. The frost in this shot vanished in the early morning after the sun came out, around 6:00 a.m. Mars time. 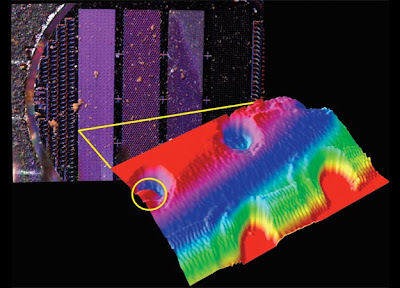 Image In Close-up : In addition to a regular microscope, Phoenix packed some heat: an atomic force microscope (or AFM) capable of spying on individual dust grains. On the left is a snapshot of silicon plates and at right is a 3-D simulation of the plates, which shows dust-gathering pits machined into the surface. The pit on the upper left snagged a piece of dust just 4 ten-thousandths of an inch wide. Color on Mars is hardly a straightforward affair thanks to a ruddy red hue cast by airborne dust. That's why scientists built super-bright yet energy-efficient LED lamps into the camera near the end of Phoenix's robotic arm. Each red, green and blue light helped produced color-accurate photos of digging areas and soil samples -- and this light show, of course. 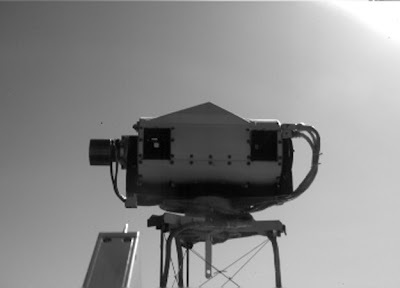 Robotic Camera : Taking on a human head-like quality is the Phoenix Mars Lander's stereoscopic camera, photographed by the robotic arm camera. By using each "eye" of the SSI, or surface stereo imager, scientists were able to create 3-D images of the surroundings. 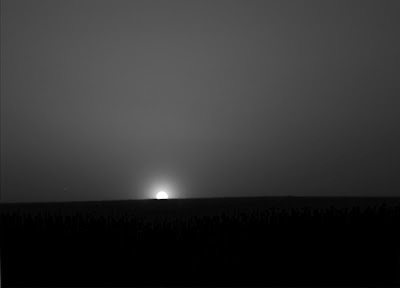 Night In Mars : All good things must come to an end. For scientific operations of Phoenix, it was the merciless cold of the Martian north pole. 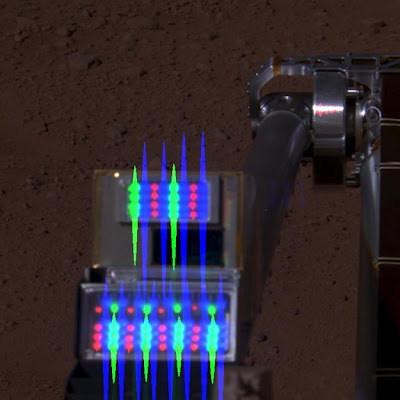 Sunlight became scarcer on the Red Planet for the robot, causing surface temperatures to dip below -141 degrees Fahrenheit at night. Phoenix relied on heaters to keep its electronics and batteries functional during chilly nights, but in late October it began dipping into " Lazarus Mode " because not enough energy was available to power the spacecraft's science activities. Soon the lander will be caught in an endless freeze-thaw cycle: being entombed under meters of carbon dioxide and water ice during the Martian winter, then thawing in the summer.